Written by chris maroulakos on Monday, May 11th, 2009 at 9:23am. Your friendly neighborhood weathermen at Owl&Bear are predicting some strangeness in the air this summer. According to our satellites and advanced meteorological technology, July 14th will be partly cloudy with a slight chance of rain and a very high chance of deadness. 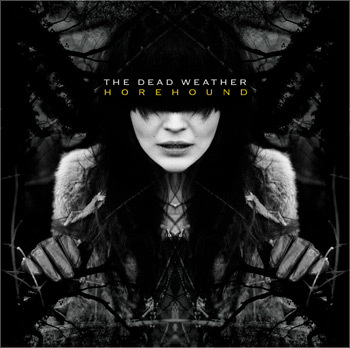 The cause of the humidity and morbidity appears to be the impending release of Horehound, the debut album from supergroup The Dead Weather. 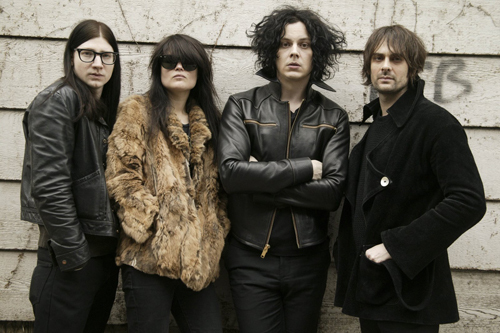 The band, which features The White Stripes’ Jack White, The Kills’ Alison Mosshart, Queens of the Stone Age’s Dean Fertita, and that long-haired guy from The Raconteurs, already released a seven-inch single—the blistering “Hang You From The Heavens”—for last month’s Record Store Day. The band will be supporting the new album with a North American tour that includes a stop at San Diego’s Street Scene festival in August. Pre-sale tickets for many of the tour dates will be available starting Wednesday, and can be purchased by following the links here. Fans purchasing pre-sale tickets will also have the opportunity to pre-order Horehound at a discounted price. We’ve got the full list of tour dates and your first look at the cover of Horehound after the jump. Be sure to wear your poncho.